This is Puja Agarwal from Hyderabad. I received my Canadian PR last week. Appreciate the Abhinav team effort to process my application and handling all queries well. Particularly would mention Shalini Rana, she was great all through the process. Keep up the great work. Will definitely recommend you guys to family and friends. 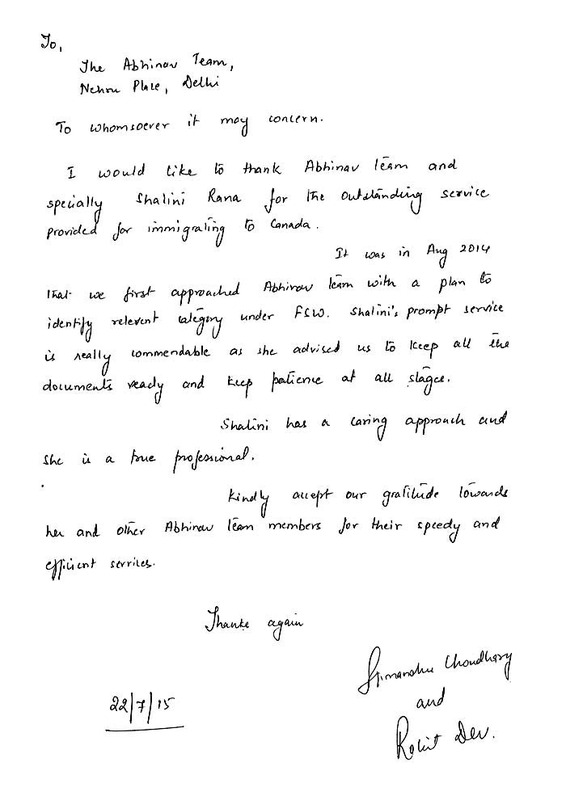 I am writing this letter to express my appreciation to you and Abhinav Outsourcing for your assistance in Canada immigration application process. I am very much impressed with the way you have handled everything pertaining to our Canada PR case. I really commend the prompt service provided by you (Shalini and Himanshi) and your help in enabling us receive Canadian visa. I would love to recommend your services to anyone who is looking for Canada visa. I have received my ITA against 23rd draw held on 18/Dec/2015 by CIC. Attached certificate for your kind reference. I would like to pay my heartily thanks to Komal Ji, Himashi , Shekar Ji, Mumbai Abhinav Staff and Delhi Abhinav Staff for their guidance and on time attendance to my queries during the journey to attain ITA stage of my application. Further requesting to make sure for submission of PR application to get PR Visa without any error. Please help on the same with your professional expertise at this final stage of my application now. I have experienced Abhinav services for various Visa purposes ( like my HSMP UK Success story- Shekar has key role for the same, AU PR Visa ) and always strongly recommend to my friends, relatives and even to unknown/needy people during my blog/ forum discussions. Reason behind all this is not success of application as i always mentioned to all of the Abhinav staff members but there is only one reason that is " Trust and You" on Abhinav and that is like Everest (Still, Steady, Tall, Un-Comparable). This trust is standing on your sole impression and direct interaction and friendly touch to all of your customers . I have always strong motivation from you and strong believe of patience. I stay with Abhinav Services like family member and never feel hesitation to inform negatives in addition to positives. And for that thanks to you for extension of wide bandwidth to me as customer. I would like to not forget to pay my thanks to Komal Ji for taking my calls and attendance to silly queries even after office hours. Same time I have my special thanks to Himanshi and Sheker Ji for their support from day one till today. Rohit Ji, I always thankful to you for your opinion and direction. Please help making right submission of my final stage of application to attain PR. This is to express my heartfelt appreciation and regards for Team Abhinav Outsourcing for their tireless and maticulate efforts, they put in, with me for my immigration process to Canada. Right from the point of contact to documentation and follow ups ,the team guided me and took care of all the details. Thanks to each one of you who have helped me during the process of my Canada immigration. We (Me and Sangeetha) are absolutely delighted to see these letters after waiting for almost 10* months. Thanks a lot for your timely assistance ,thorough documentation and co-operation through-out. I will certainly send any references requiring visa assistance to your office. I thanks the entire Team for making my dreams come true of getting Australian PR. I truly appreciate your hard work and your competence in this area. Moreover, you have supported me a lot from day one and on the top I am elated to see placid demeanor in handling my quires in a professional manner. I especially thanks Geeta and Gaurav for their effort, determination and also appreciate their quick response to my emails. Having said, if I came across anyone who is looking forward to settle abroad then sure I will recommend and speak highly of Abhinav Outsourcings Pvt. Ltd. It has been a wonderful experience with you guys and above all a great feeling to be granted visa without much hurdles. As you know, I had filed for visa on 4th November 2015 and was granted the same on 26th November 2015 which is around 22 days. Thanks for your cooperation and mutual efforts which led led us to such quick grant. Looking forward for your further cooperation. Iam extremely thankful to each and every individual of ABHINAV for joining hands to get me a visa. Ms Geeta Madam and Mr Gaurav ji I do not find words to express my gratitude for the help you rendered to me. Iam shore that Abhinav will continue there success record of guiding and helping the people who want to migrate.